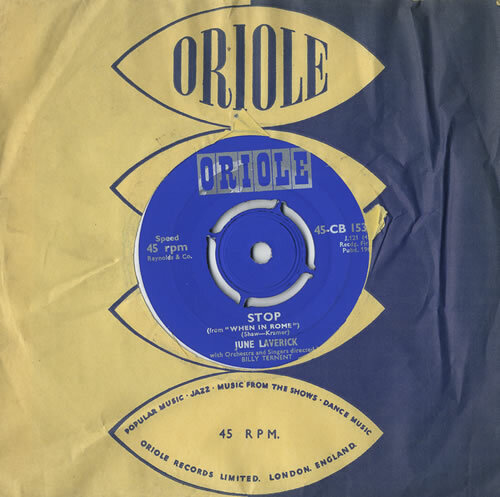 JUNE LAVERICK/ JOHNNY WEBB Stop (Rare 1960 UK blue and silver Oriole label 2-track MONO vinyl 7'' single with 4-prong push-out centre intact. From the When In Rome longplayer, backed with Concertino by Johnny Webb, with orchestras and singers directed by Billy Ternent. Housed inside an Oriole company die-cut sleeve. This particular rarity comes from the vast personal archive collection of a former music reviewer and journalist and has been locked away in storage for more than 30 years! CB1537).